Career Footsteps recently made a journey to Bristol, a port city with a rich maritime history and the proud home of John Cabot who sailed across the Atlantic and named Newfoundland in Canada. On the July 9, students at the John Cabot Academy welcomed Career Footsteps and a range of volunteers from many industries. They sailed through their questions about different careers which the volunteers were happy to answer. 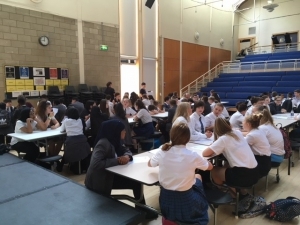 The year 8 students were presented with the opportunity to ask volunteers from a range of careers in a careers speed networking activity. 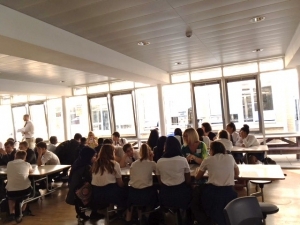 Every year 8 student had the chance to network, and gain confidence in speaking with new adults. Many commented on the openness of the volunteers and felt they were left with a greater understanding of different careers and vocational routes into the world of work. Afterwards, students had the chance to work on skills which look great on a CV and enhance employment prospects with a series of volunteer led workshops. They worked with Cherry Sinclair from Reach Robotics learning more about robotics, and how to create their own company. Cherry brought along her four-legged assistant to help – Mekamon, a spider robot. The students also had a chance to learn about the work of Ruth Case, an Orthopaedic Surgeon. Ruth gave a great overview of the different careers in medicine as well as dispalying different orthopaedic implants. Jack Cook and Diane Bryant from DAC Beachcroft both ran two different workshops. Jack’s workshop explored his own career path and the post 16 options available to students. Diane Bryant talked through an assessment day, giving students a typical group activity used in assessment days. Students had to work together to a find the robber using the clues in the text. Alison Pavier, a Director at her own Consulting Firm continued the workshops with a focus on all the soft skills required for certain careers. The students learnt about the importance of transferable skills and how to highlight their own skills in interviews. Johnathan Krzyzosiak, a Safety Case Engineer, with a passion for life coaching and personal development concluded the workshops. His workshop was focused on success and what it means to the students. A successful day for both students and volunteers. Many students felt they now had the confidence to sail toward their own chosen profession. Career Footsteps is a programme run in partnership with the Edge Foundation that aims to open students’ eyes to the wide range of routes they can take into the world of work with a focus on vocational and technical paths. Find out more here, and if you took a vocational pathway into the world of work and would like to inspire the future generation to consider the same sign up at the top of the page.